Kid friendliness: lots to eat, especially duck! Peking roasted duck is a guilty pleasure of mine. 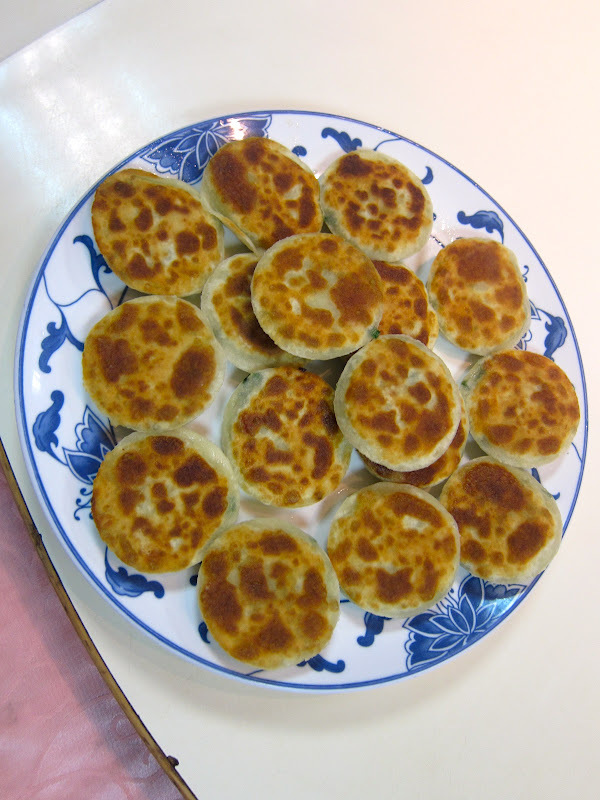 The crispy skin, the slathering of hoisin sauce on the pancake, rolled up together for a fatty, juicy bite. There are quite a few good options for peking duck in Taipei, but none like Song Chu. At first glance, it seems like just any other Chinese restaurant in town from the outside. But apparently, Song Chu is so popular they book their reservations for a whole month, the month before that month. Still with me? 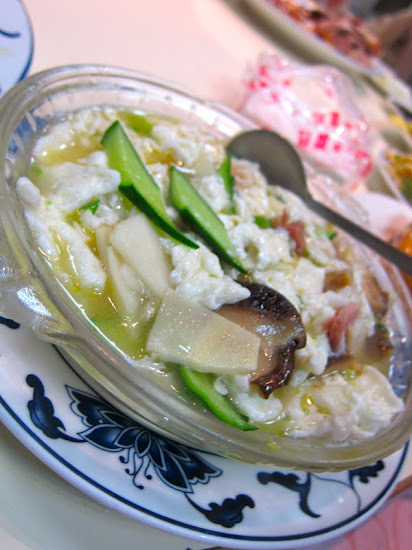 My friend asked me in early February if I wanted to try Song Chu in late March. Talk about torture, waiting two months, thinking about duck. I said yes, of course, but didn't hear about the semi-complicated reservation system that is as hard to book at Ludobites until we were eating lunch together. On the first of every month, diners call in to the phone number in attempt to get a live voice to secure a table, or can wait in person at the restaurant when they open- to get a reservation for the next month. Talk about planning ahead- perhaps this way they have their duck inventory down to an exact number. The menu is only in Chinese. When asked if there was an English menu, they didn't even respond. I suppose if people can't even walk in to eat, you'd have someone who could read Chinese in your party to even know how to book at table there. But there's a ton of things on the sprawling menu- you'd never been able to order it all- the next time I'd like to try the lettuce wraps, or candied sweet potatoes. Orders come in small, medium and large plates and are priced accordingly. There's lots of familiar and unfamilar looking things that quickly arrive to the table, filling up the lazy susan. and chopped chives in pan fried bun, which also needs to be ordered when you make your reservation. Skip the fried bread, I've had it crispier and sweeter at other places, like Xiao Shanghai. 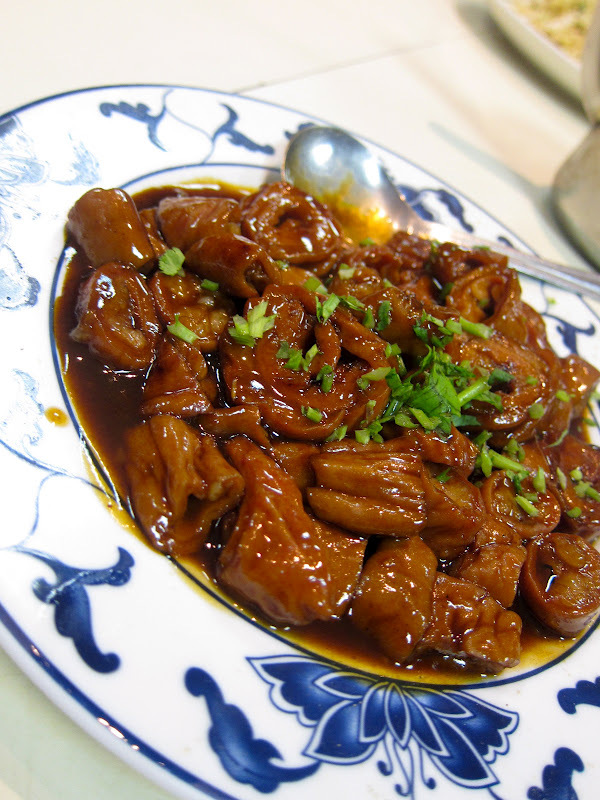 Although the dishes are very tasty, you have to save room for the main event- the duck. 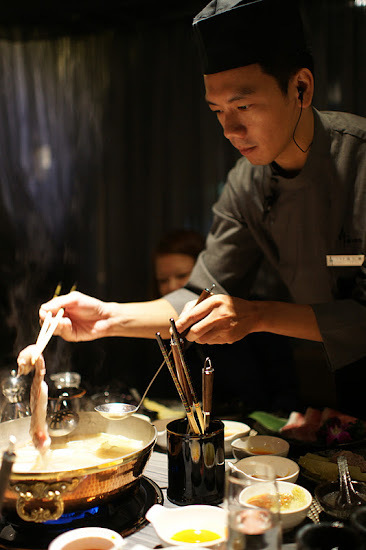 Unlike some other restaurants where they show you the duck, only to whisk it away back to the kitchen, Song Chu carves tableside, with deft precision and speed, separating the crisp skin from the fat and meat. As I'm taking pictures (along with half of the table), they warn us to not stand too close since sometimes oil spatters from the carving. 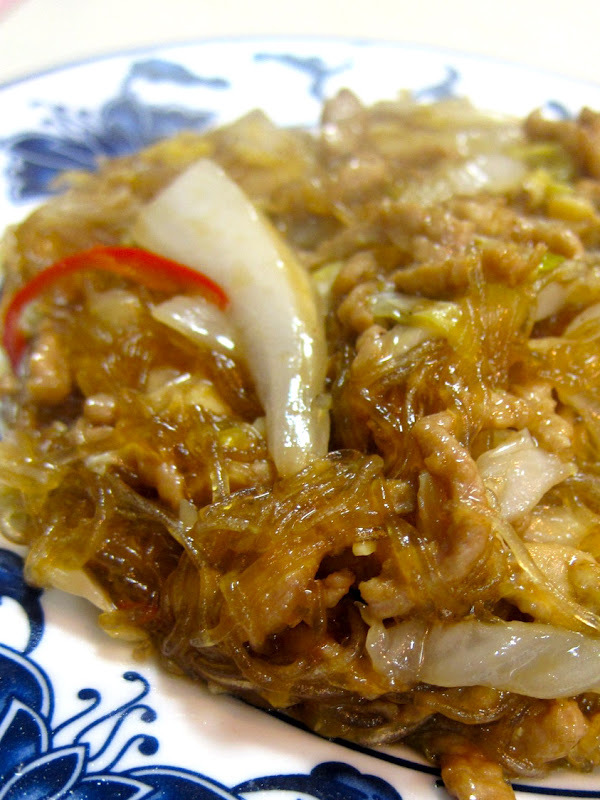 along with a plate of hoisin sauce, green onions and thin pancakes. 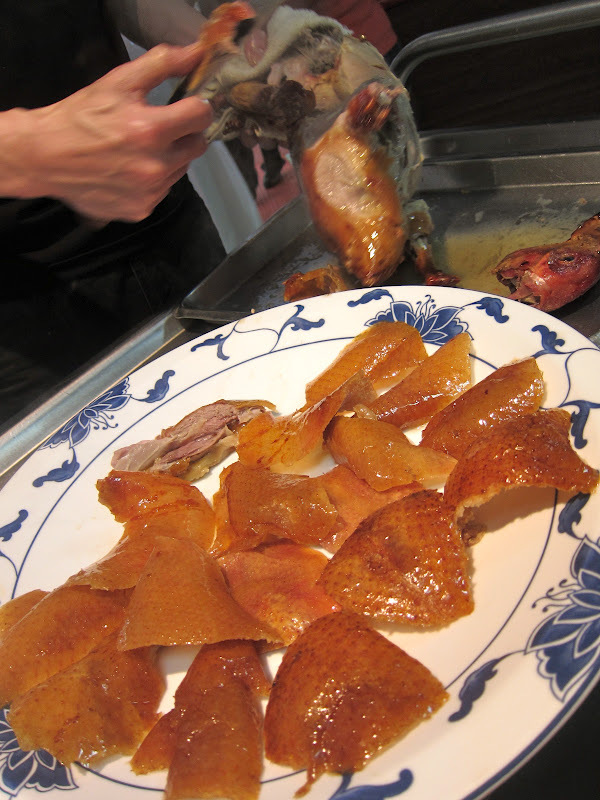 It's so good and best eaten hot before the duck skin gets colder and you realize how fatty it all is. The more people you have, the more you can order. But be sure to specify and order more than one duck when you make your reservation if you have more people so there's enough to go around. After the carving, the duck has a second round of being served, in soup, or stir fried with basil. 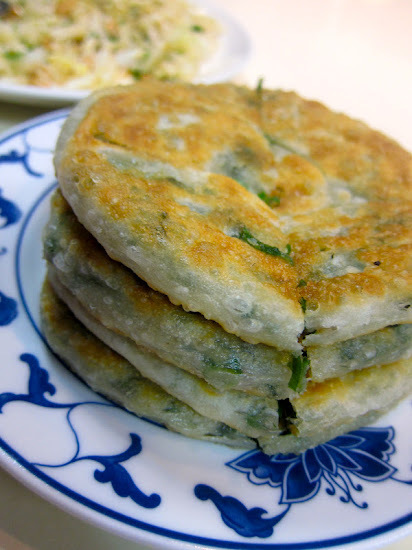 If you have room for dessert, the thin and sweet red bean sesame pancake is a solid choice, almost the size of a pizza with small slices for each person. I don't know if I would have the persistence to try to call in and make my own reservation (I've heard it's like trying to call in to a radio station to win tickets, you just have to keep redialing), but if my friends manage to grab a reservation, they can count me in! What do you think? Who's been there and is it worth the trouble? Tomorrow is May 1st, who is going to try calling? 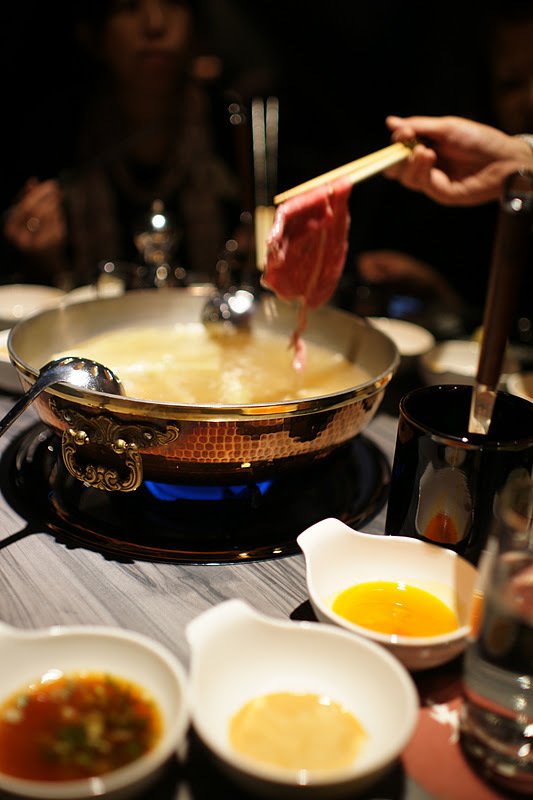 When the weather gets cold, it's time for hotpot. I've never experience hotpot in so many ways until I moved to Taipei- one person solo hotpot, mala spicy hotpot, and the deluxe gourmet hotpot. How do you make hotpot luxurious? Ideally, with the setting, the ingredients and the service. 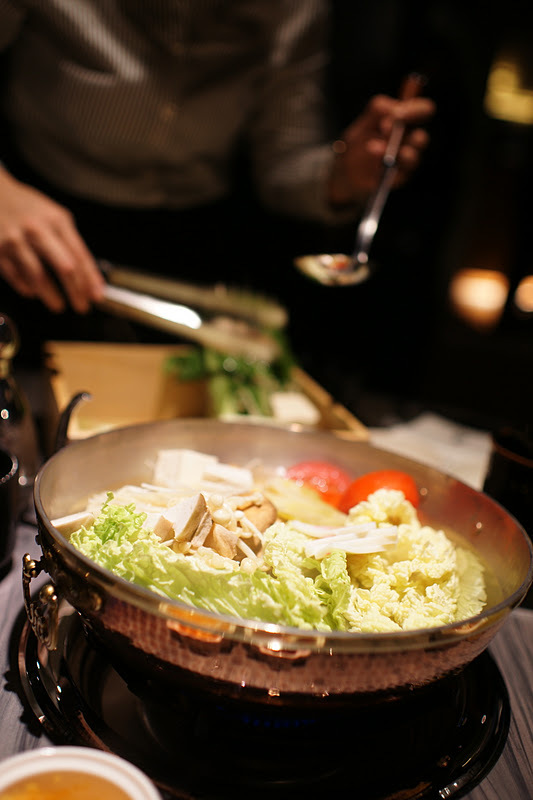 Last year, the owners of Ben Teppanyaki converted what used to be their private rooms next door into a whole new space, Ben Shabu Shabu, a high end hotpot restaurant offering premium ingredients for those willing to indulge. 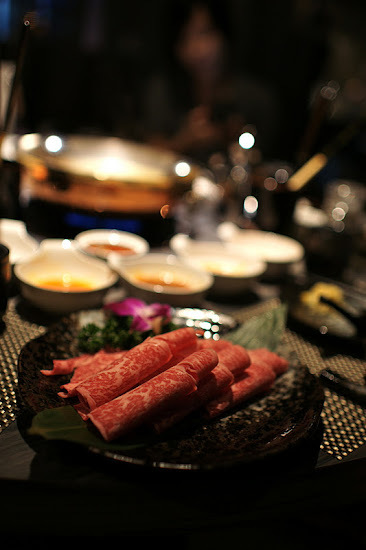 Set courses are available from NT$700-NT$3500, with various types of pork, lamb, sirloin, beef and seafood available. 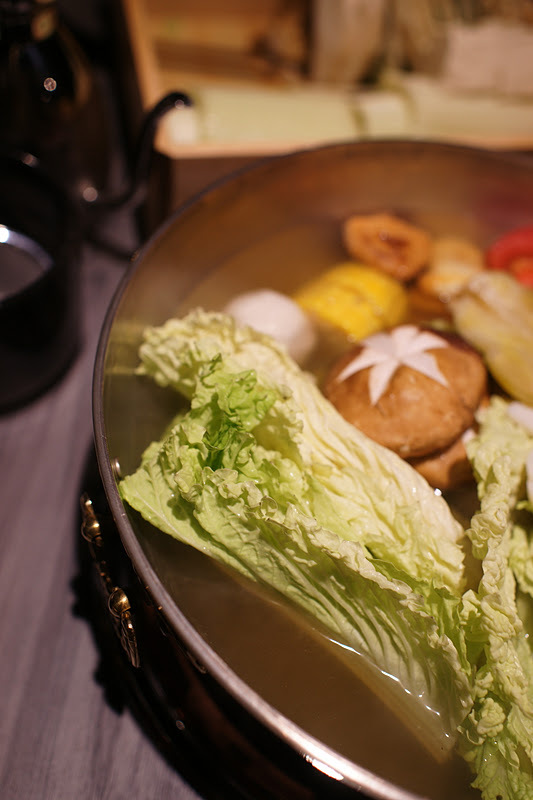 In Taipei, shabu shabu joints are getting fancier and fancier with ambient lighting and decor. What I noticed about Ben Shabu Shabu was that there were larger tables for groups as well as tables for 2 for couples, with plenty of space between tables and sheer lavender draperies for some semi-privacy. Private rooms are also available downstairs. 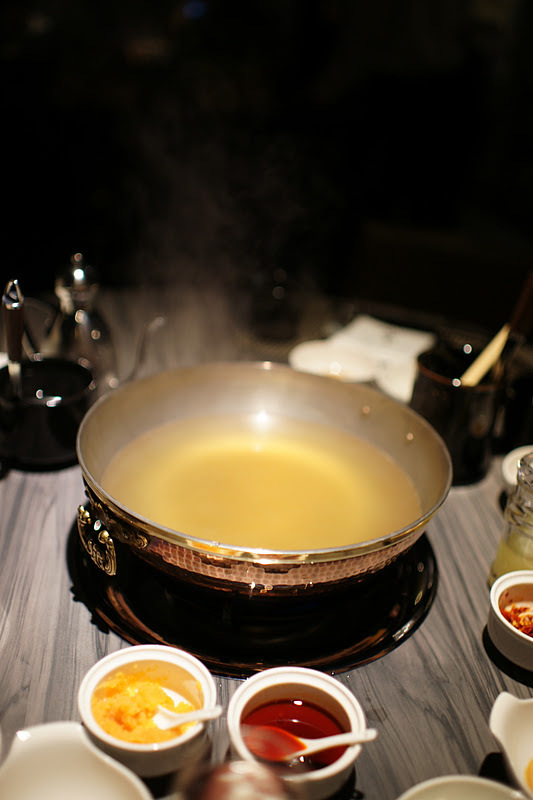 As I sit down at the table, the shiny copper pot immediately reminds me of Orange Shabu Shabu, a popular Taipei hotpot joint that is also known for their luxe ingredients and environment. This is not necessarily a bad thing, especially if you can't get a table at Orange. 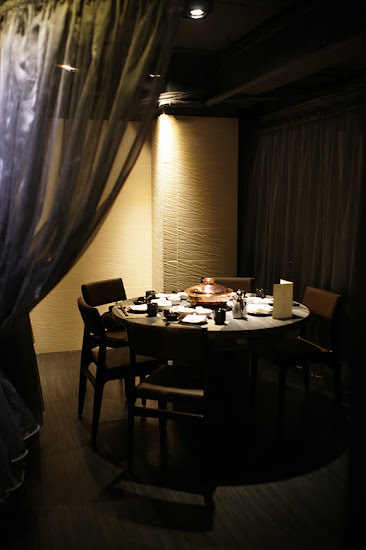 Live seafood in the tanks in the back, as well as bar seating for solo diners or those wanting a quick meal. As part of the set course, a plentiful assortment of cabbage, mushrooms, tofu and squid balls to fill the pot- it's almost like a box from the farmer's market. and okra with ikura and baby oyster. 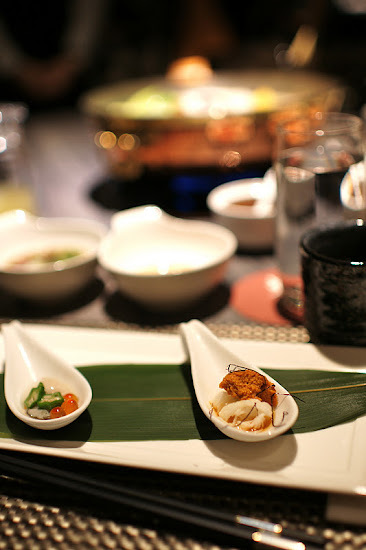 Eat the mini appetizers while you wait for the broth to boil and everything to cook. 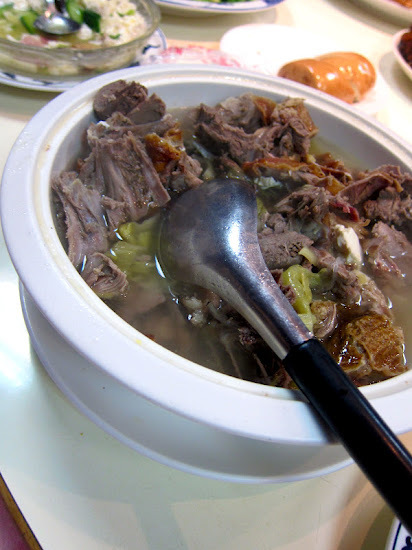 Once the pot starts boiling, you can cook the meat. 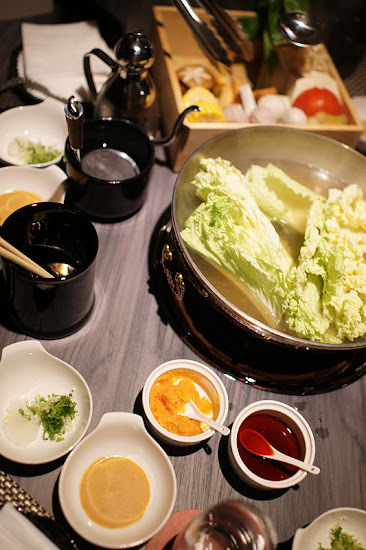 I prefer my veggies, especially the chinese cabbage on the softer side, but the bonus of shabu shabu is that you can do it the way that you like. If you get a chance, scoop up this piece of tempura that has a surprise in the center, chewy mochi. The event's menu is in Chinese only, but the regular menu has English as well. 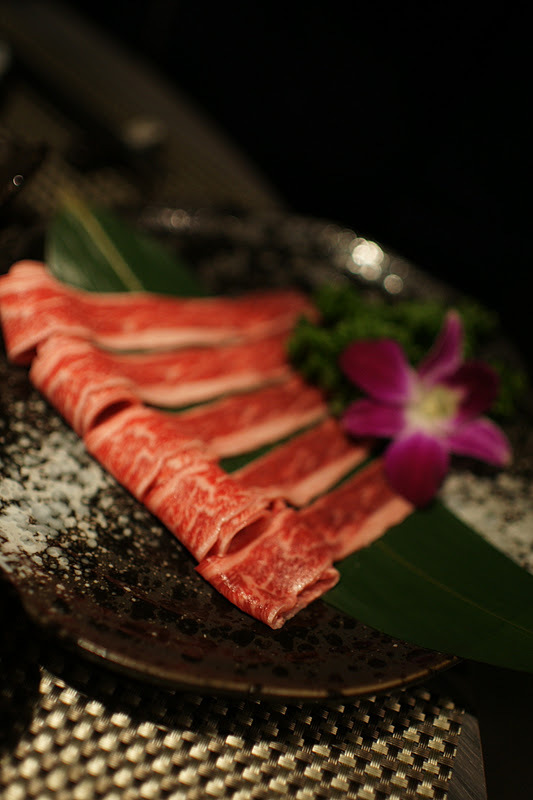 The Triplet Wagyu Beef Course last year had both Australian and USDA Waygu beef, which had subtle differences. The USDA Waygu short rib might have been my favorite. The waitress did some of the cooking for us and asked how well done we liked our beef. 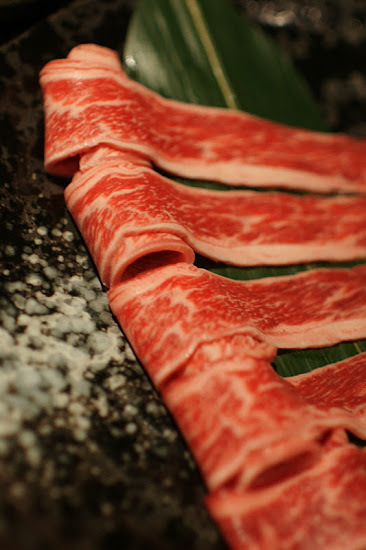 She recommended a 5, or medium rare, which was a little too pink inside out for me and a first for me at shabu shabu. 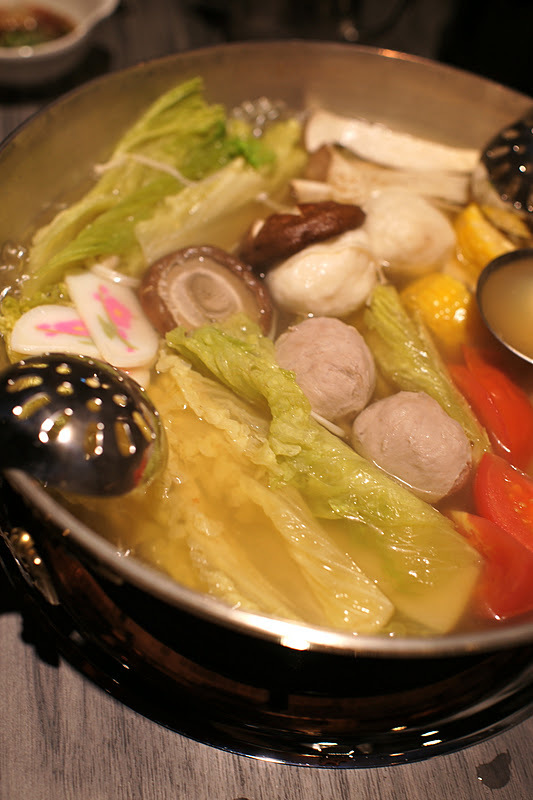 But with shabu shabu, it's no problem, just put it back for a couple swishes. Each nibble of wagyu is more velvety and tender than the next. With swirls of fat throughout the beef, it can't help but to be delicious. 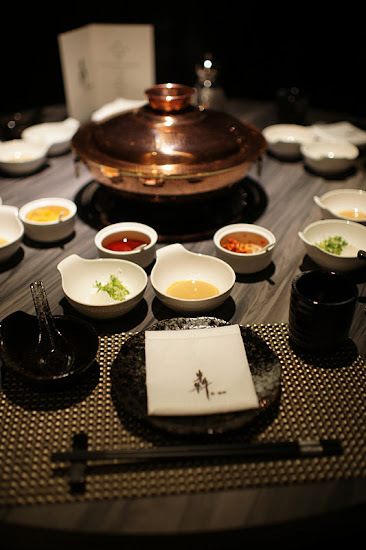 A very expensive kind of delicious at NT$3380 for the Triplet Wagyu Beef Course. For that price, there are quite a few other meals I'd probably choose first, but there are less extravagent options on the menu. 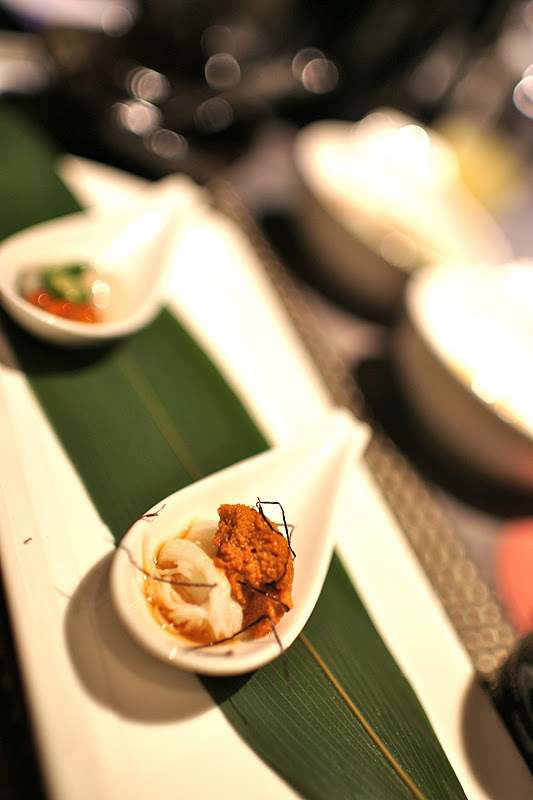 We were lucky to have the chef cook a few pieces for us, but usually you are dependent on your server's expertise. 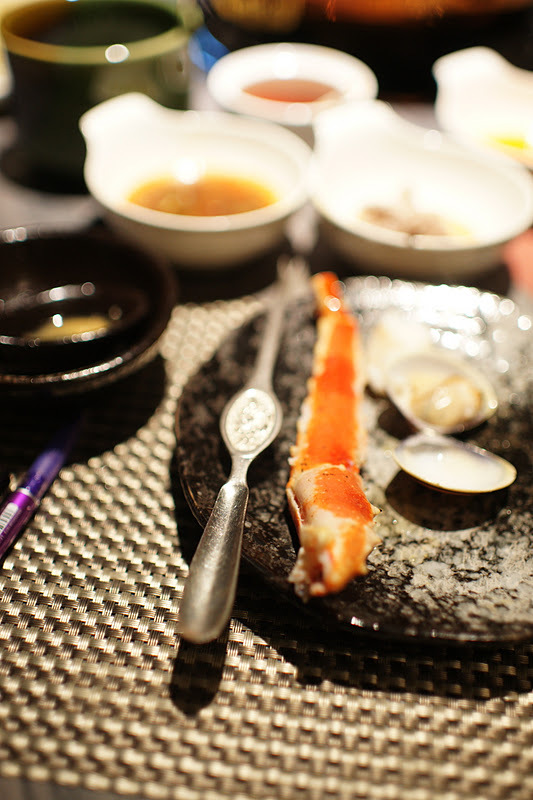 The assorted seafood set includes emperor crab, fish, clams and lobster (NT$1280). 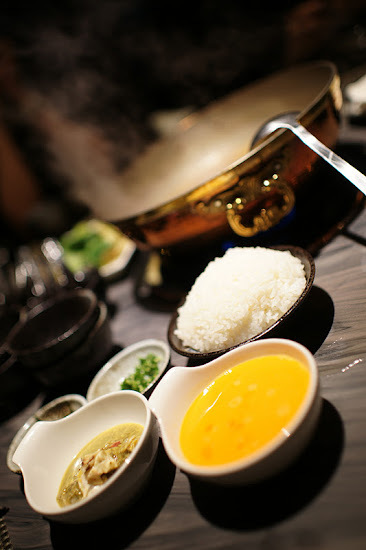 I still think it's mesmerizing to watch them clear out the contents of the hotpot and then transform the broth, a bowl of rice, egg, scallions, seaweed and crab roe into rich and creamy congee. Stirring, stirring and more stirring. Usually everyone is so full by this point, but somehow the stomach makes room for another bowl. 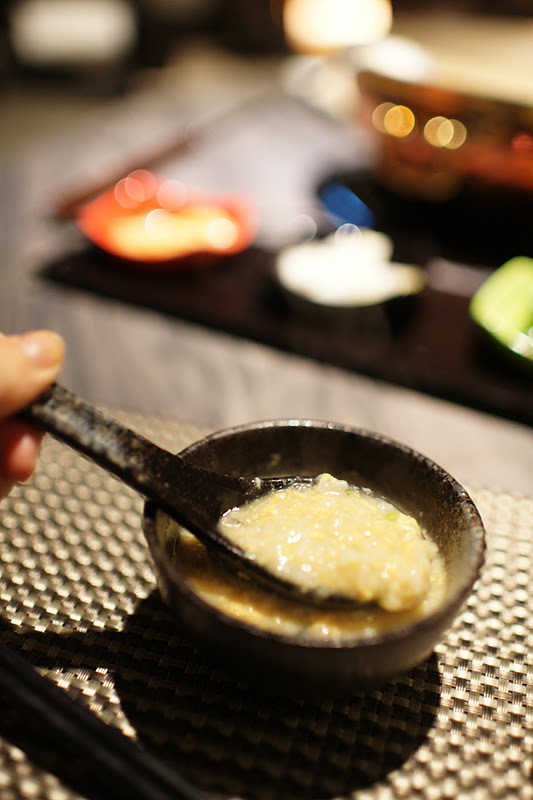 The sweet saltiness from the crab roe gives it that extra layer. Definitely can't eat like this all the time, but when you can afford a splurge from the wallet and the stomach. Thanks to D for the invitation to tag along and to Ben Shabu Shabu for special lunch!